Our range of Original Classic Style Cafetieres in Gold and Chrome Optima Cafetieres available in 3,4,and 8 12 cup sizes. 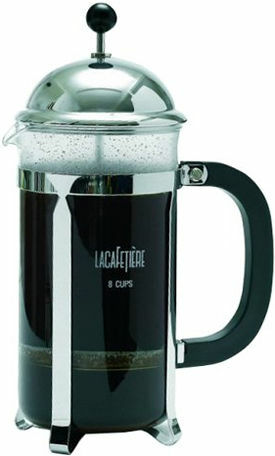 These are the 24-carat gold or Chrome plated on brass classic cafetieres made by La Cafetiere. This the original design which is approaching its 30th anniversary, a true classic. - Price includes free U.K delivery. 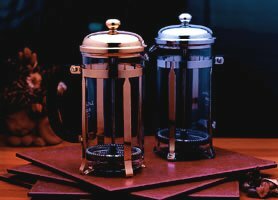 This picture shows the Classic Cafetieres, note the chrome or gold plated knobs on the top, this is the difference between the Classics and Optimas, also the Classics use a slightly thicker metal in the construction, also the optima has a more rounded lid. The optima range only comes in Chrome and does not come in a 4 Cup. Note the photos all show black plastic tops, this is incorrect for the classics, the photos are for display purposes only and all the classics have got chrome or gold knobs. The difference between this and the Optima is that the Optima is made of a sligthly thiner metal and does not have the silver knob on top of the plunger on the lid, also the Optima lid is more rounded. 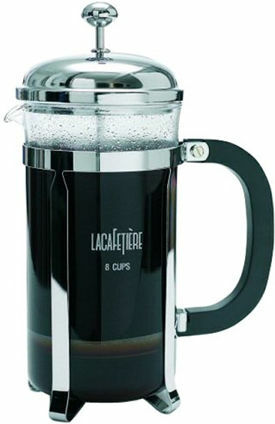 This is a similar design to the original gold/chrome plated orignal classic cafetiere, an original design which is approaching its 30th anniversary, the optima is a slight variation on the Classic, same basic looks but use of a thinner metal and plastic knob make the optima a lower price, note the more rounded lid. General Notes: Beakers are made of glass except the Duro range which has a hard wearing plastic.